A Public Order Police officer, who appears to have played a leading role in forcibly removing Economic Freedom Fighters leader Julius Malema and other EFF MPs from the State of the Nation Address this week, has boasted on Facebook of a “hunt for Juju” in the “once hallowed halls of Parliament”. 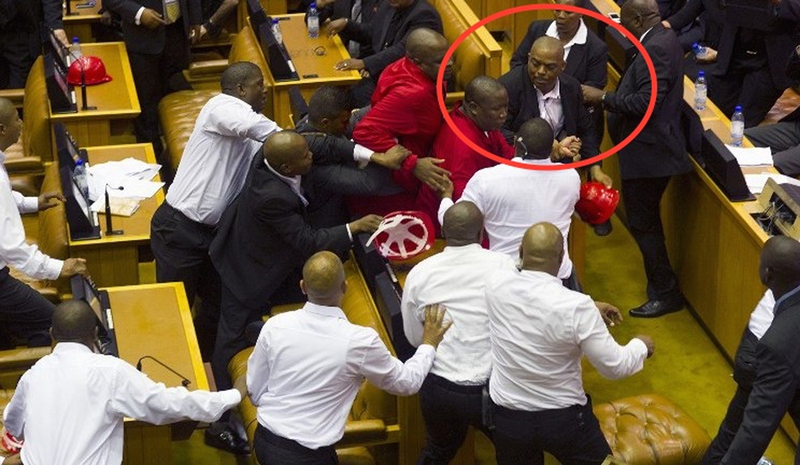 Wearing a black Hugo Boss suit jacket, Captain Walter Prins led a phalanx of white-shirted “security forces” into Parliament on Thursday after they were instructed to forcibly remove Malema and two other EFF MPs from the House. By JULIAN RADEMEYER. Daily Maverick identified Prins, 43, from a high-resolution photograph taken by the agency EPA. It clearly showed his security pass which designated him part of a “high risk” detail and stated that “WW Prins” was from “SAPS”, the acronym for the South African Police Service. Prins’s Facebook posts over the past six months raise disturbing questions about whether he and other members of the Cape Town Public Order Police (POPS) unit that he belongs to felt they had a blanket mandate to target Malema. Then, on 20 September, Prins posted three photographs on his timeline of police in the foyer of the parliament building. The pictures appear to have been taken on 21 August as police entered the precinct. Prins can be seen in all three wearing a police uniform and riot gear. “In the once hallowed halls of Parliament, in a hunt for Juju LOL,” he wrote underneath. On Friday, Prins also posted a link to a YouTube video of the melee. “Good work tjom. That’s what i want to see happing to poepol (sic) who think that Parliament is a circus,” a friend commented approvingly. Contacted on his cellphone on Saturday, Prins told Daily Maverick that he could say “absolutely nothing about Thursday evening”.